Housed in a wall-mount, watertight plastic enclosure, the CN1514 and CN1517 Series are versatile, multi-zone controllers. 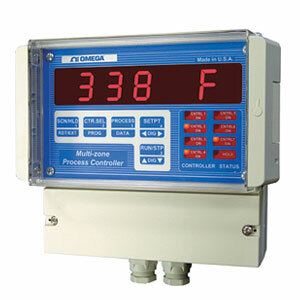 They feature multiple control modes that are ideal for a full range of applications, from simple to complex processes. Input type for each zone is selected independently. Scaling and offset allow current and voltage signals to be converted and displayed in engineering units. Temperature from thermocouples, RTDs, and thermistors can be displayed in °C/°F. In addition, each zone has its own ramp/soak profile, with up to 7 segments. On/off, as well as PID control, is offered for optimal process stability. Processes that do not require tight control through complex tuning of PID parameters can be run under simple on/off control. Each zone has its own set of on/off and PID parameters, and each zone can be programmed for heating or cooling. Setpoint deviation, positive as well as negative, can be viewed. Additional functions include min/max reading for each zone, indefinite program hold, automatic scanning and displaying of different zones, and 3 display modes (setpoint only, process only, or both setpoint and process). Power, control, and process signal connections are conveniently made with Euro style plug-in connectors. Each zone has a 3-digit-long engineering label that can be programmed to indicate the type of process being controlled (e.g., °C or °F for temperature, psi for pressure, etc.). Every controller's run status is indicated by LEDs. Channel display time is also programmable.